Drama. There are five companies in the NASDAQ (not necessarily in the 100) that have had double- and triple-digit returns this year for no apparent reason. The anointed five are: Angie’s List (+106%), Diamond Foods (+79%), Groupon Incorporated (+149%), Marvell Technology Group (+65%), and Zynga Incorporated (+56%). These five companies are singular but not alone; there are twenty-eight of the big-cap NASDAQ stocks that did not qualify, or “marginally” qualified, for inclusion in the Perpetual Bond™ this year. 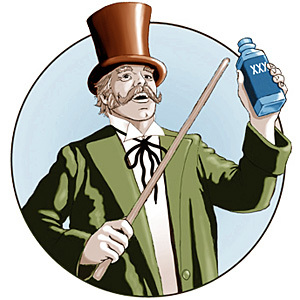 But – unlike the “anointed five” – those companies lost minus (-6%) in aggregate since December, even though the NASDAQ Index is up +22%, and if they hit all their stop/losses, based only on the demonstrated volatility and not “surprise”, they could lose another minus (-12%) if the market fades. Please see Exhibit 1 below. In view of those facts and possibilities, we might think that the anointed five would sell some of their stock into a demand market by means of a rights or secondary offering, and help themselves to much needed cash on the balance sheet – if they have some plans in need of capitalization (of which we’re not sure). But increasing the stock float might not be possible because their stock is substantially owned by a handful of institutional investors who will, undoubtedly, decide the next pay day and who gets paid. For example, Angie’s List is 30% owned by just four investors: T. Rowe Price Associates Incorporated (11%), FMR LLC (11%), Wellington Management Company LLP (4%) and Morgan Stanley (4%); Diamond Foods is 20% owned by five of which two own 10% between them; Groupon is 35% owned by four investors of which two own more than 20% between them; the Marvell Group is 20% owned by five of which two account for 12% of the company; and Zynga is 15% owned by five investors but three account for more than 10%. Moreover, they’re trading at 50× earnings and their entire debt could be subsumed by increasing the float by just 20% if the stock prices held, or even went higher, respecting the “growth” opportunities that their major shareholders have bought forward. But who will buy them from them? Please see Exhibit 2 below. Notwithstanding such “opportunities” in futures, the market is rich in opportunities for investment now, and there are a dozen stocks in the Perpetual Bond™ that have had better returns than the “anointed five” this year; for example, Tesla (+400%) and Netflix and Softbank (+200%), and over thirty with returns in excess of +50% (plus dividends in many cases). And we’re continuing to buy and hold these “high priced” stocks (with the usual price protections against “surprise”) because, and only because, they are trading at or above the price of risk. For example, the NASDAQ 100 “Ghost Riders” Portfolio of eighty companies that are in the Perpetual Bond™ is up +129% for the year, and has added +5% in September, and we have added another nineteen companies to it in anticipation of next year. But none of the “unbelieveables” or the anointed five. Please see Exhibit 3 through 7 below for the reasons. Angie’s List Incorporated operates a consumer-driven solution for its members to research, hire, rate and review local professionals for critical needs, such as home, health care and automotive services. 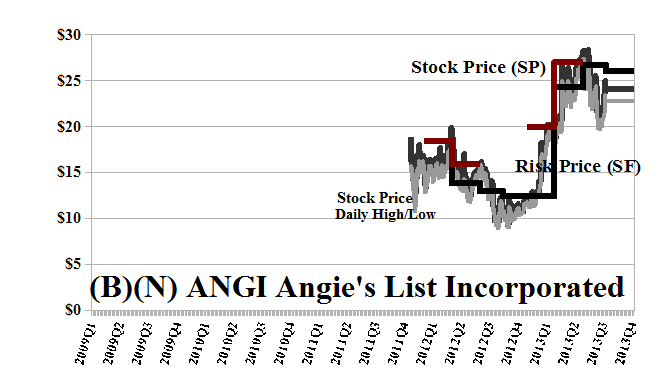 Daily trading of several hundred thousand shares of Angie’s List is normal, but there have been several days of more than ten times that volume in which nearly 10% of the shareholdings changed hands. 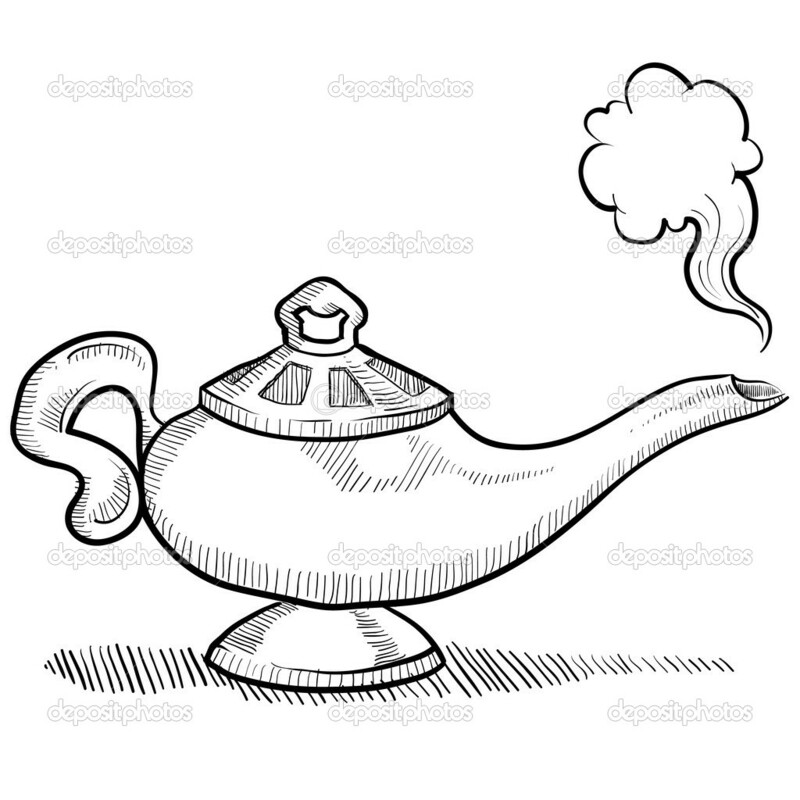 Did they find the “genie in the lamp”? 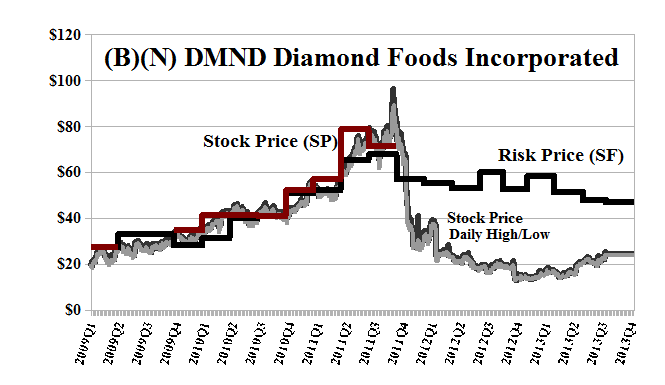 Diamond Foods Incorporated is a food company that deals in processing, marketing and distributing culinary, in-shell, ingredient nuts and snack products. 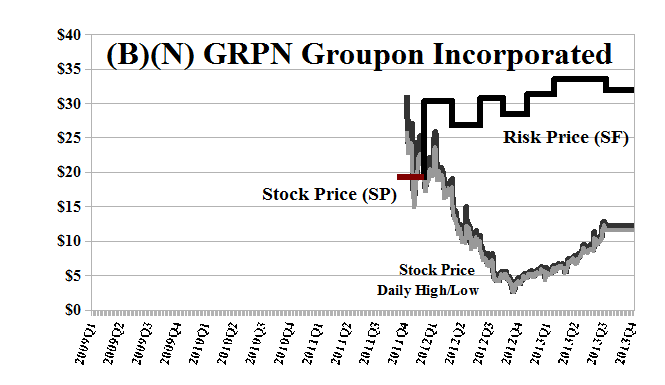 Groupon Incorporated provides a local e-commerce marketplace that connects merchants to consumers by offering goods and services at a discount. The company features a daily deal on the best stuff to do, see, eat, and buy. 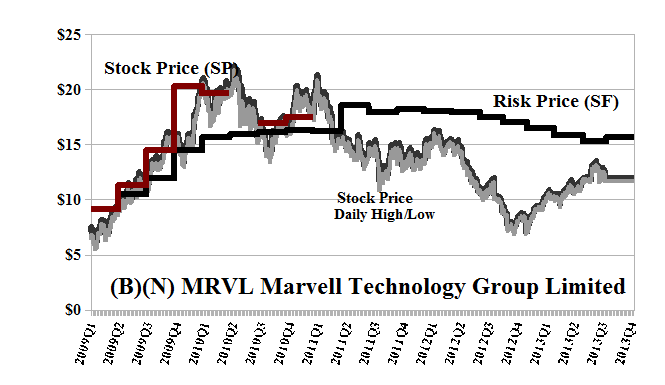 Marvell Technology Group Limited is a fabless semiconductor provider of analog, mixed-signal, digital signal processing and embedded microprocessor integrated circuits. 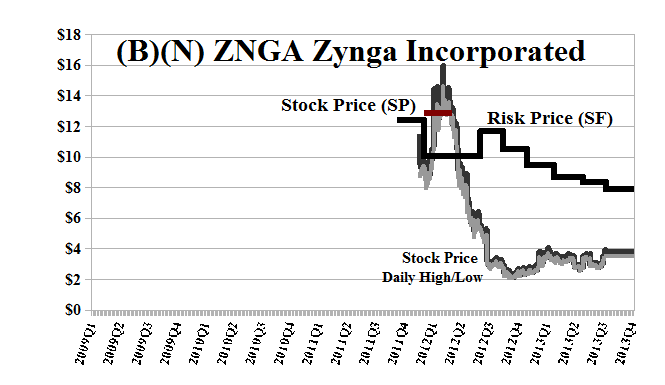 Zynga Incorporated is a social game developer. It has its games on multiple platforms both PC and on mobile. Games such as Farmville, Farmville 2, Zynga Poker, Castleville are developed by this company. All of these companies are still in the trading zone, (N), of investor uncertainty because they are trading below the “price of risk” which we estimate by the calculation, the Risk Price (SF). The “price of risk” is the stock price that provably resolves a Nash Equilibrium between “risk seeking” and “risk averse” investors, neither of whom is investing in order to have a better chance of losing their money. They have the same objectives but a different view and necessity of how their money might be used to obtain a hopeful, but not necessarily guaranteed, non-negative real rate of return. The price of risk, therefore, needs to be “earned” because there are two sides to it (both the seller and the buyer, sometimes wearing different “hats” or having a different necessity), and once it is earned, stock prices tend to stay above it, absent new information. 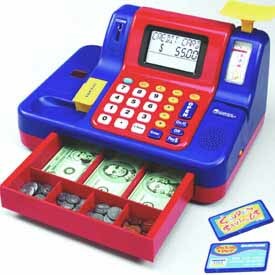 Too Much Selling. Not enough Buying. Stock prices below the price of risk haven’t done that job – they haven’t demonstrated that a cash investment in the stock is as good as cash and better than money; that is, it’s likely to maintain its value and obtain a hopeful, but not necessarily guaranteed, return above the rate of inflation. No amount of “paper shuffling” or investors buying and selling the stock to each other will do that for long and we, as investors – we want to keep our money -100% capital safety – and obtain a hopeful but not necessarily guaranteed return above the rate of inflation – can afford to wait until the price of risk is proven. Investing in (N) has opportunities but is always a gamble absent a provable arbitrage of which the price of risk is one.